Whatever you think of the modernist outline, this is quite simply a great guitar that any working player could use at sensible 'part-timers' price. Intelligent, original design; ultra-sharp build; top hardware and pickups; versatile yet familiar. Vintage obsessives will struggle with the modernist style – their loss. Intelligent design is, for many, a dirty word in today's vintage-fixated world. Even those musicians who want to push the sonic boundaries more often than not choose from a small group of classic designs. But the flipside to that way of thinking is that we're steadily seeing more and more original designs - and not just those limited to high-end, one-off custom shops. Which brings us to this 2016 release from John Page, a refreshingly original take on a classic. On the one hand, the AJ sticks closely to the Fender recipe, certainly in terms of its basic alder body and maple neck ingredients, but John has re-envisioned the outline, which is never a easy thing to do. When we draw around both the AJ and a vintage Telecaster, the changes appear less on paper than they seem in the flesh. The base is more curved, and the waist-to- lower bout lines are slightly flatter, while the most obvious change comes with the upper shoulder that is flatter and curves into the rounded nose of the heel then into the treble cutaway, with a horn that is much less hooked. It loses some of the Tele's slab- like look and feel by adding Stratocaster-like contours and a larger edge radius. When strapped on, these tweaks make quite a difference: the body 'disappears' and feels a part of you. It's a proper bolt-on, too: all the Classics use bolts, not screws, to connect to nuts inset in the base of the maple neck, with each of the four bolts held in a thick recessed washer, which removes the need for a neck plate. It's far from rocket science, but intelligent craft nonetheless. Sustain is rarely something we need to comment on with quality builds, but it's noticeably good here - as if there's a compressor in line squeezing the last ounce of the note's decay. This modernism is tempered, however, by a pretty beefy feeling neck, which has a full deep C shape with quite full shoulders and lovely curved fingerboard edges that roll into the face. The ends of the fret slots are cleanly filled; the fret ends and tops of the medium-but-high wire (approximately 2.36mm wide by 1.3mm high) are expertly finished. The neck has an untoned satin sheen that continues the modern vibe, although your hand is telling you you're playing something with a lot more heritage. There's no disputing the headstock influence here, but string trees are unnecessary thanks to the height- adjustable posts of the Gotoh tuners, and while not everyone will enjoy the signature 'scribble' logo, that open hole truss rod makes any tweaks dead simple. The attention to the smallest detail is evident everywhere, not least the nicely rounded edges of the thick single-ply pickguard, the smooth-feeling domed and knurled control knobs, plus a toggle switch - all of which are laid out more like a modern PRS than a vintage Tele. The high-wall bridge has through-body stringing as supplied, but with the option of top-loading, too. It houses a reverse taper for its Tele-style single-coil pickup, while the neck soapbar looks like it should always have been there and is height adjustable without having to remove the pickguard, as you would with a vintage-spec Tele's neck pickup. Three brass saddles continue the classic ingredients, but these are compensated; compared with a vintage Tele, this is an easy guitar to dial in. Even the output jack on a thick metal football plate is perfectly gig ready. Unscrew the recessed and shielded rear control cavity cover and you see beautifully tidy wiring, 500k pots, a treble bleed cap on the volume, and a .022 microfarad cap on the tone - all in a cavity that's shielded with black conductive paint. It's clean enough to eat your dinner off it. The lightweight, balanced and contoured body isn't unique to the AJ, of course, but from any player's stance is all welcome. The neck might require a little adjustment, especially in the lower positions, but the wider feel is perception not reality - at 42.87mm, it's pretty Fender-regular with 36mm string spacing splaying out to standard Fender 55mm spacing at the bridge. The lightweight, balanced and contoured body isn't unique to the AJ, of course, but from any player's stance is all welcome. Our '69 Tele is slightly trimmer at the nut (41.27mm wide with 34mm string spacing), while the AJ's depth of 21.68mm at the 1st fret and 23.3mm at the 12th compares closely with our Fender reference, which measures 21.4mm at the 1st and 23.1mm at the 12th. The control placement puts the volume control sort of midway between where the pickup selector and volume control usually sit. The toggle switch is placed as if a Tele's control plate has been reversed and is in a line directly below the volume, while the tone is pushed out a little. Initially, the toggle's movement is a little odd, placed at an angle from the strap button to the tone control: pushed towards the tone we get the neck; towards the strap button, the bridge. But once you get your head around that, it's very intuitive and requires just a quick finger movement to change it. Going back to a real Tele now feels rather industrial. The combination of the pickups and their placement is part of the key to the AJ's sounds. The bridge is less spiky, less steel-y on top, but still very 'Fender' with punchy lows, while the neck pickup - nicely balanced in volume and colour - adds that fatter single-coil voice, with a clarity that traditional T-style neck pickups can lack. Does it add more 'Gibson'? A tad. Generally, the sound is more complex than the more direct response from our reference, and it sounds a little more refined - in a good way. The volume and tone tapers are good, and with that intuitive control layout, it's very much for the player who uses their controls. It certainly has the feel of the journeyman about it: Fender-esque, for sure - this AJ doesn't just work for Nashville picking. In error, we kicked in a gained classic rock Marshall voice from our Yamaha THD head and, on bridge, we drop into edgy early Van Halen or the sort of sounds that grace many a Heartbreakers album. Pull the gain back and (sorry, we couldn't resist!) tune to open G for Stones riffs, not to mention those contemporary, rockier country licks that just fall out of the guitar. To say it would make a great recording guitar is understatement. 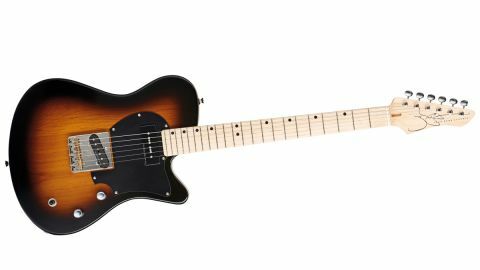 It's very in-tune, the flatter radius seemingly suiting a less Fender-specific player, which is no bad thing with the diverse sounds it can create. In terms of function, this is a faultless piece. Hugely Fender informed, it's like a producer has taken a 'raw' Tele, EQ'd it and added compression but without losing its DNA. There are plenty of other makers, of course - Fender included - who have done similar things, but it doesn't stop you appreciating great craft and great design.